I was frustrated with this contact sync mess. I found a simpler way. Make sure you’ve gone into Settings > Accounts > Google and disabled sync on the accounts you don’t want synced. Then go to Settings > Apps > look for contacts and contact storage and clear data and force stop both of them. Finally open contacts and see what happens. For me on my LG G4, contacts resynced and I only contacts on the account I wanted contacts for. Is this going to erase all of my regular phone contacts, in addition to the contact lists that I unsynced? It will; in my case (and I think the common one) anyone you put on your phone will also be sync’ed with Google’s servers (and visible in contacts.google.com in your browser to be sure) but I can imagine it is possible to choose phone only. Thanks a lot Geoff & Nicholas!. This is wonderful! No offense Geoff, but Nicholas’ method is much easier! You might even consider rewriting it with his permission. I used it to clear out my contacts and calendar after adding another Google account and forgetting to turn off sync right away. I agree, a checkbox at the time of adding a new account would be such a great idea! Anyway, I just turned off that account’s sync and left my normal one on. Then after I hit [CLEAR DATA] from Apps > All > Contact Storage and Calendar Storage, I just waited and eventually everything was back to normal. Easy as pie! Thanks to both of you though! You have helped us out a lot! Google really should make a better contact management system. With smartphones we can do wonders these days, but we have forgotten what phones are for it seems, and some basic stuff which should be flawless by now is actually a bigger mess than the pre smartphone era! -Had to change Apps settings to “Show System” to get contacts storage to show up. -After clearing contact data, they did not automatically sync on opening the Contacts app. I had to turn sync off and then on again for that account before they would download. I’m so glad I don’t have to sift through my work contacts anymore! 1. Go to Settings>Accounts>[select account you don’t wanted synced], and make sure Contacts sync is turned off. Repeat for as many accounts as needed. 2. Next, go to Settings>Apps, tap Menu (the three dots) and select Show System>select app called Contacts storage (not the app called Contacts)>Storage>Clear Data. 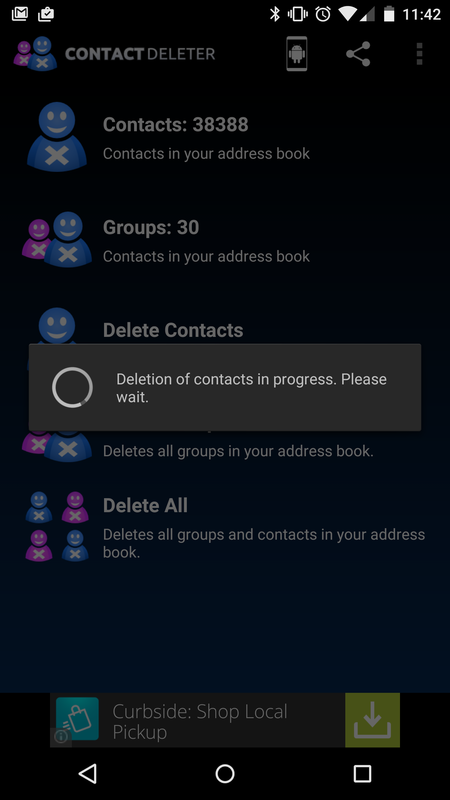 This method does not involve any actual deleting of contacts, online or off, and is not affected my the modified timestamp, it simply clears the list on the phone and forces it to repopulate. Hope the share helps! Aaaand… I just noticed someone already shared this method in a comment. Just to clarify, I only cleared the data on the Contacts storage app, not the Contacts app, still worked fine. I did force stop the app as well, but I don’t think that’s actually necessary. If it doesn’t automatically start re-syncing, you can simply go back to Settings>Accounts>[the account you want contacts synced from], make sure contacts ARE set to sync, and rather than turning sync off and on again (which should also work fine, but once in a while is buggy and doesn’t sync everything), click the three dots in the top right corner to open the menu, and Sync now. Thank you!!! I was desperate to get the many work and volunteer-activity contacts off my phone after syncing those accounts. I tried all the suggestions on this page that apply to my LG Stylo 3 Plus interface. It worked! But only after rebooting my phone. Now my list of phone contacts is clean and tidy. Many thanks for restoring my sanity!